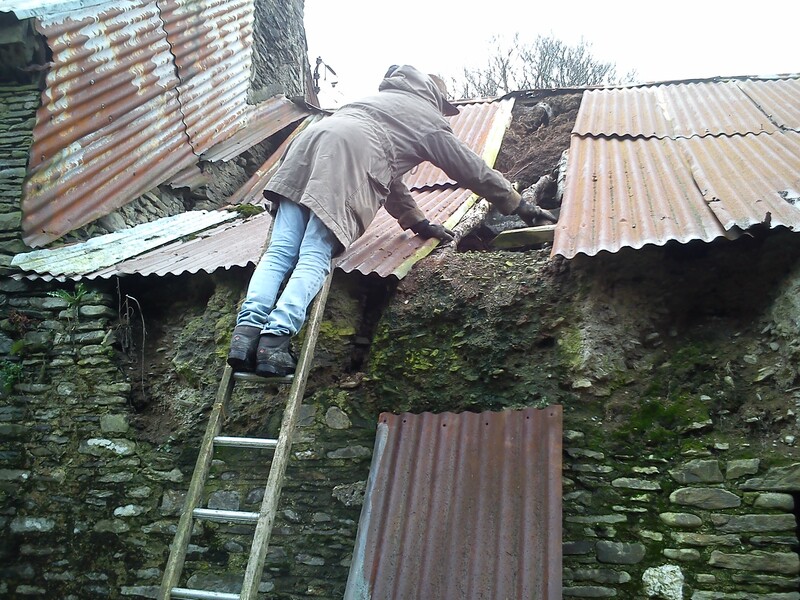 Our planning application to return our farm house roof to thatch was handed into the Council Office on Wednesday but on Saturday, we had to put back the tin on the front of the roof as on Friday, the tarpaulin couldn’t cope with the downpour of rain. 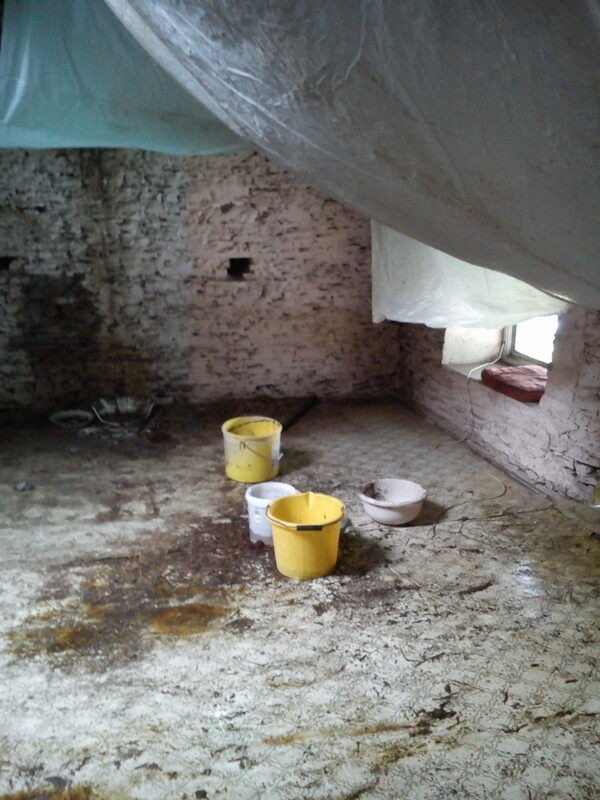 Roof problems for both the house and the attached cattle byre began in February 2014…..
As the wind and rain hammered the British Isles, we did our best to protect our property…. but as the wind blew up the valley from the south, it entered the byre and lifted the roof frame from the house, spilling tin sheets onto the ground. In a lull between storms, we attached metal struts across the top of the roof in an attempt to hold it down but as the wind picked up, we watched as the roof lifted and sheets fell to the ground. 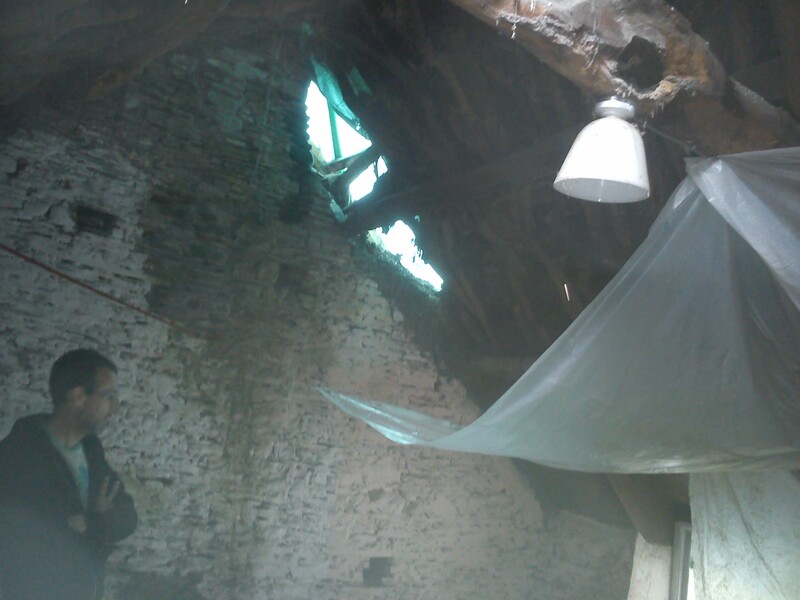 There was nothing we could do…not even a temporary roof over the byre would have saved it from such a violent storm and would probably have lifted off and caused even more damage. 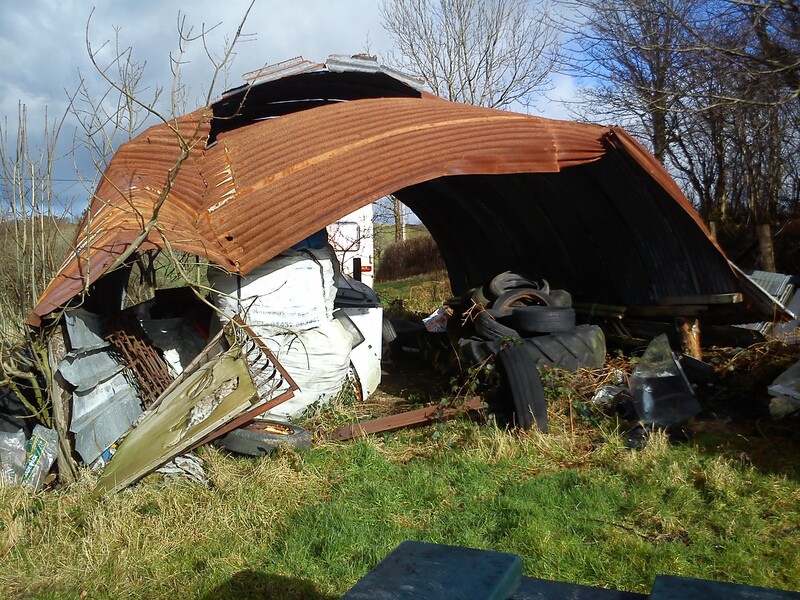 The force of the wind pushed in the front of another barn… but it did save our caravan from being blown down the hill to the bottom of the field! 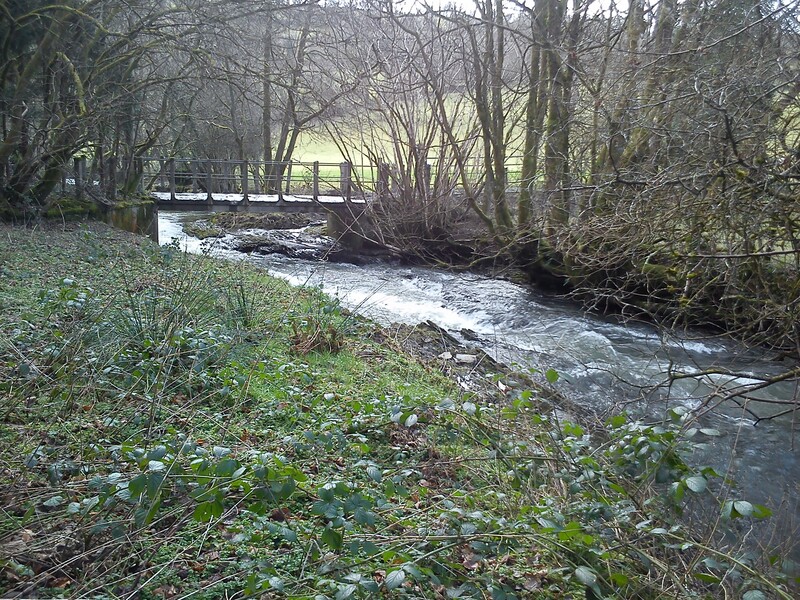 The river rose to the highest point we’d seen it but didn’t burst it’s banks….. and our neighbours in the water mill below us, escaped from being flooded out. 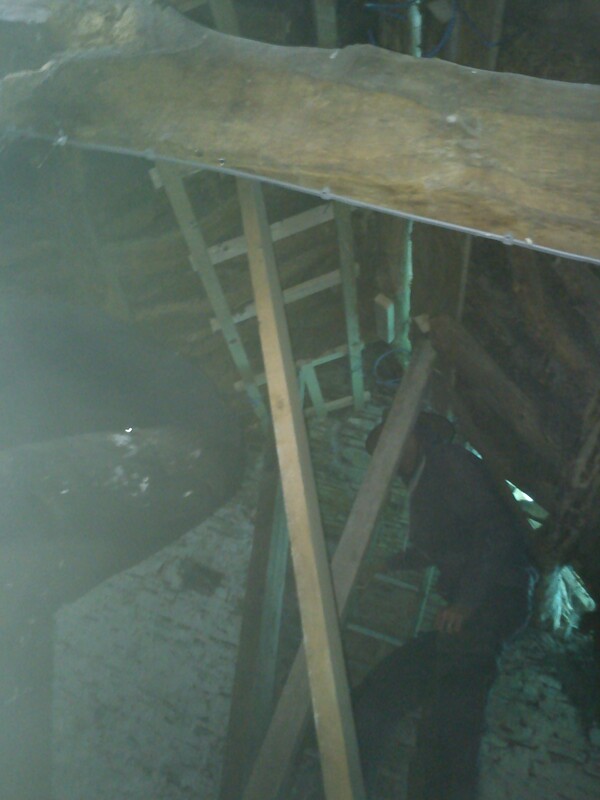 The house roof coped well and we had enough buckets and bowls to cope with the drips and the waterfall running down the chimney breast upstairs. 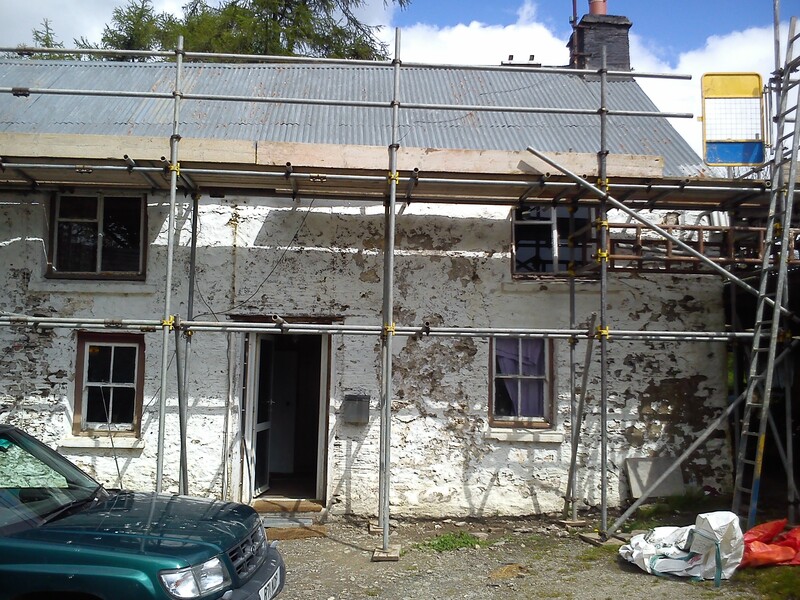 Once the weather eased, we secured a local conservation architect to work on plans for the house and the byre. 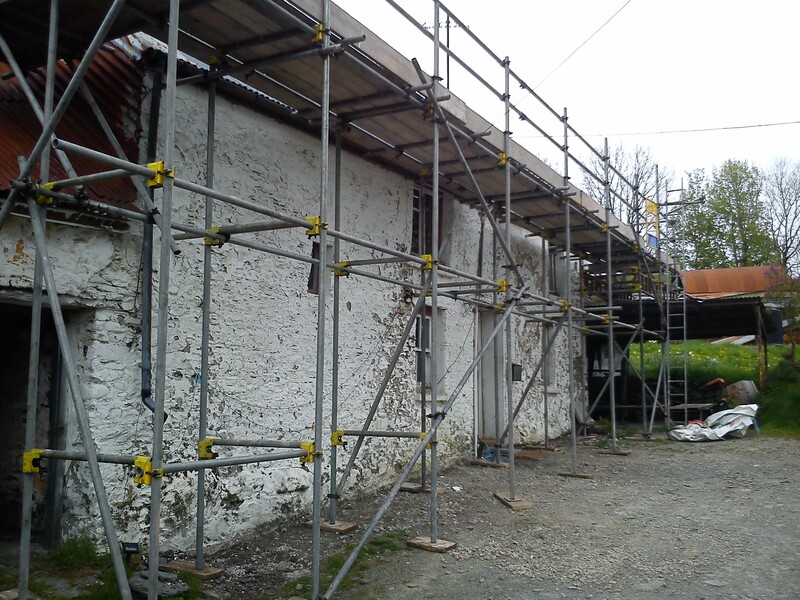 Our original plans were not to work on the byre in this first stage of work but the storm damage necessitated a quick response in order to preserve an already damaged building. As far as we knew, all was going ahead and at the end of April, the scaffolding arrived for the thatchers to begin at the beginning of May. 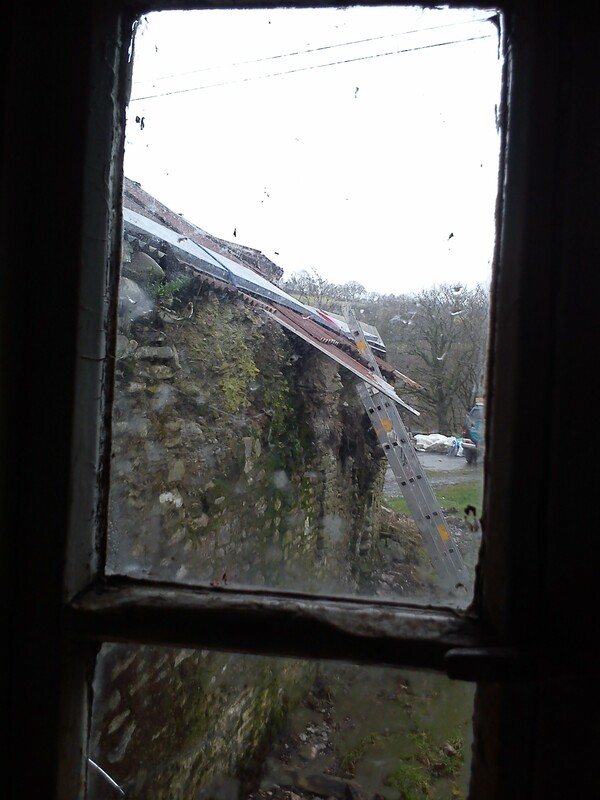 The thatchers arrived soon after but unfortunately, our desire to press on with making our home water tight, to preserve the stone walls topped with clom and the amazing cruck frame roof structure was met with refusal by Listing. 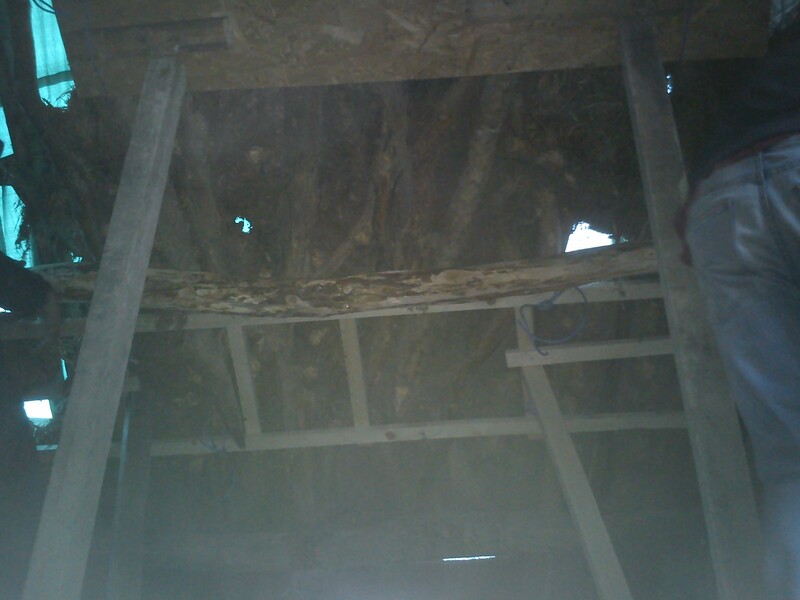 The front tin had been removed to ascertain which purlins and common rafters needed replacing before thatching could proceed and this act was deemed ‘criminal damage’. We just escaped without a fine but all work was stopped until full planning and approval by Listing could be obtained. We await planning and Listing’s pleaure as to when we can have a roof on our house and our dream of a water tight home has taken….one step forward…two steps back.